In the Regina Mundi Church in Soweto, painted by Laurence (Larry) Scully, in 197, 8 x 5 foot. 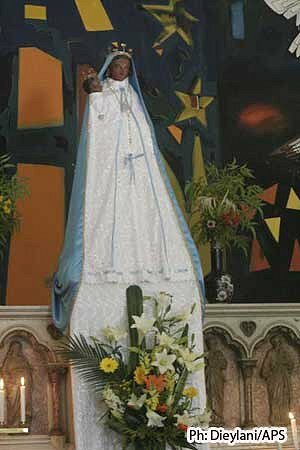 Even when African Madonnas are black, they are not necessarily called by the title Black Madonna. The fact that this one is, deserves attention. 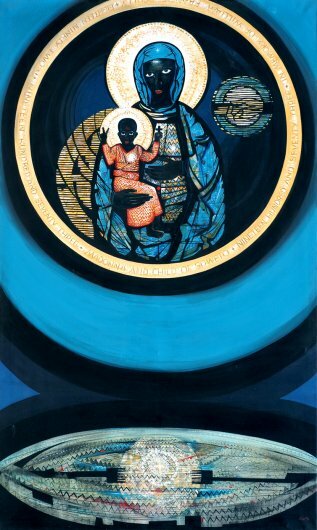 The artist, Larry Scully, named his painting The Madonna and Child of Soweto, but she is known in her town simply as The Black Madonna. In 1973 The Star newspaper, a liberal, anti-apartheid newspaper in Johannesburg commissioned Scully to paint a picture to raise money for an education fund for black South Africans. Scully painted The Madonna and Child of Soweto, some 8 foot by 5 foot in size. Harry Oppenheimer of Anglo American bought the painting that was then donated to the Regina Mundi Church in Soweto. Regina Mundi was the site of much anti-apartheid activity both in the 1970s and through to the ending of apartheid in the 1990s. Numerous funerals of activists were held in the church and many organizations used the church for meetings. During the student uprising in 1976, (several thousand) students fled to Regina Mundi after police shot at them. (Police stormed the church and opened fire, killing several people. To this day one can see the scars of this brutal act of violence.) In 1997, Nelson Mandela declared Regina Mundi Day in recognition of the importance of the church to the anti-apartheid struggle. As Michael Morris has noted the painting "had a prophetic quality: the focal point is the child's right hand, forming a victory sign. "[Morris Interview with Scully in Matieland February 2002}. Today thousands of visitors from all over the world still see The Madonna and Child of Soweto on tours of the City and the image of the black Madonna is printed on t-shirts that are sold across South Africa. 17 km North of Mbour, 80 km South East of Dakar, in an ecological sanctuary, 1888. 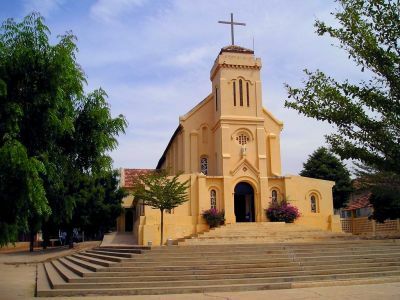 In 1887, Bishop Mathurin Picarda visited the mission of the Holy Ghost Fathers in Guéréo, Senegal, for the baptism of its first Catholic converts. The priests took a walk along the coast to the village of Popenguine. "What a magnificent site for a sanctuary to the Virgin!" the bishop observed. A native of Brittany, he decided to designate a famous Black Madonna from the neighboring province of Normandy, Notre Dame de la Délivrande, as patron saint of the shrine he wanted to see built. A Norman benefactor provided a replica statue. Her title was altered from the Celtic Notre-Dame de la Délivrande to the French Délivrance and she was installed in Senegal on May 22, 1888, the Tuesday after Pentecost, with a great procession. The shrine at Popenguine suffered many closures and setbacks during the next century. There were a building collapse, epidemics of yellow fever and sleeping sickness, the Great War, and a shipwreck that took the lives of the bishop and 16 missionaries. The area remained primarily Muslim, but the Catholic faith and devotion to Our Lady of Deliverance persisted. A new church was built, dedicated in 1988 to the Immaculate Conception of the Most Holy Virgin Mary and proclaimed a minor basilica in 1991 at the request of Cardinal Hyacinthe Thiamdoum, a native of Popenguine. Pope John Paul II visited the shrine and crowned the statue of Our Lady of Deliverance on February 20, 1992. Tens of thousands of pilgrims, many of them organized groups of young people, and many inspired by rumors of Marian apparitions there, go to Popenguine for an annual celebration on Pentecost Monday, the Black Madonna’s feast day. They celebrate a solemn mass and then a procession from the church to a nearby grotto shrine of Our Lady of Deliverance in a cliff overlooking the sea. Various 2008 articles lauded the ongoing Christian-Muslim dialogue in Senegal. Its fruit is peace and it expresses itself in the presence of many Muslim families, who joined in the pilgrimage to Popenguine at the side of their Catholic brethren. In her 19th century Basilica, overlooking the Meditaranean, Rue de Zighara, Bologhine,bronze. Open daily 11-12 a.m. and 3-5:30 p.m.
Madame l’Afrique is a copy of a French statue crafted in silver by the artist Edmé Bouchardon (1698-1762), which was destroyed during the Revolution. This bronze copy was ordered in 1838 by the Archbishop of Paris, Monseigneur de Quélen. Apparently he had asked Our Lady for the conversion of Prince Talleyrand of France, a very controversial diplomat and foreign minister under Napoleon who had strong ties to the church. In order to fulfill his part of the deal, the archbishop had this statue made. Whether the Queen of Heaven granted his request is hard to tell, but many did laud Prince Talleyrand as an excellent diplomat who was often intent on avoiding blood shed. He was by no means a saint though. In many places where Muslims and Christians live together they share a devotion to Mary. (See “Mary and Islam”.) And so, on any given day one may see Muslims kneeling in the basilica, bringing their petitions to Our Lady, whom they call Lala Meriem. For more on Black Madonnas and race relations read the introduction’s sub chapter “Racial Explanations” and proceed to the Black Madonna of Soweto. The outstretched arms, smiling face, and inclined head of Our Lady of Africa mark her as the type of Madonna called “Our Lady of All Graces”. This type goes back to a series of apparitions of Mary to Sister Catherine Labouré in Paris in 1830. At that time the Queen of Heaven appeared in this pose, wearing rings on her fingers that were covered in jewels, most of them emitting a magnificent light. She said: “This is a symbol of the graces which I shed on those who ask me. Those jewels which are in shadow represent the graces which people forget to ask me for.”* She also demanded that a medal (the so-called Miraculous Medal) be crafted and widely distributed, depicting herself in this pose on one side. On the other side she wanted the cross of Jesus permanently anchored in her initial M and their two hearts underneath it, perfectly equal in size. I think this is a very significant symbol of the inseparability of Jesus and Mary and the equality of the masculine and feminine principals.